MTSU alumna weaves immigrant e.. It was the fourth trip led by MTSU President Sidney A. McPhee and his wife, retired Murfreesboro City Schools teacher Elizabeth McPhee. Other such MTSU delegations visited China in 2012, 2014 and 2016, and Dongcheng students came to Murfreesboro in 2013, 2015 and 2017. “This is not a restful trip,” said President McPhee. “The students, teachers and parents who come get up and out early and are always ‘on,’ either engaged in classroom exchanges or representing their schools and our university as part of a high-profile delegation. MTSU’s Confucius Institute, a joint effort between Hangzhou Normal and MTSU, oversees the annual exchange. Families paid their travel expenses to China, but most housing and travel costs were covered by the institute and Dongcheng. 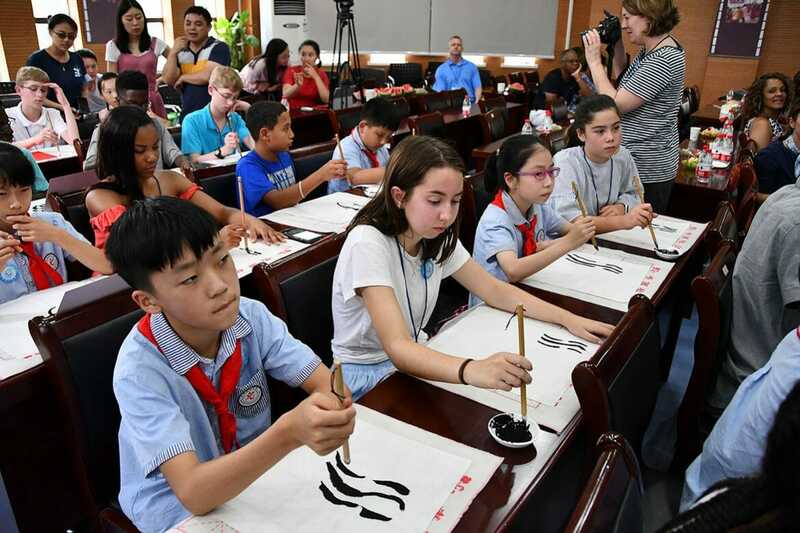 Named for the ancient Chinese philosopher Confucius, the institute is sponsored by China’s Education Ministry to promote Chinese language, history and culture through tours, exchanges and university partnerships. There are more than 440 institutes in 120 countries. Under the leadership of Director Guanping Zheng, MTSU’s institute has helped teach Chinese language and culture to more than 2,000 students in seven Tennessee counties. It also offers long-distance language training via satellite TV and the Internet. I recently had the amazing opportunity to travel to China with Middle Tennessee State University. Our delegation consisted of a group of students, teachers and parents. The purpose for our trip was to explore the education and culture of China. This incredible experience was a once-in-a-lifetime opportunity that I will never forget. Our group encountered many great things, however there were a few specific experiences I remember the best. My family had the opportunity to eat dinner with one of our hosts, the Ding family. Their family consisted of the mom, dad, grandfather, and the son, Yixin. We celebrated Yixin’s 10thbirthday, which is a big deal in China! We first made traditional Chinese dumplings with the family. After dinner, we held a birthday celebration which included eating a 6.6-meter-long noodle without stopping, then had cake with dragon fruit. Matthew, 11, travelled to China with his brothers Andrew, 11, and Issac, 13, as well as their parents, John and Jennifer. He is a fifth-grader at The Discovery School in Murfreesboro. My family and I recently returned from a two-week visit to China. We went with MTSU as an educational and cultural experience. One of my other favorites was The Great Wall. It was much larger than I expected, but I was able to appreciate the time and effort the Chinese put into placing each stone. It was an amazing experience that I will never forget. And I have made so many new friends. I now have a better appreciate of the Chinese culture and hole to return to China in the future. Alexis, 12, traveled to China with her parents Keith and Shelley. She is a seventh-grade homeschool student in Franklin. While in China, I enjoyed spending time with our host families. They were very welcoming and gave me a lot of knowledge of their beautiful cities and traditions. Throughout our visit, I liked the dancing and singing. And I loved the wonderful meals served to us – it was very good food. This trip was an amazing experience and I hope to go again someday. I know I will keep in touch with the people I let there and we will remain friends forever. Helen, 12, traveled to China with her mother, Collier. She is a eighth-grader at Central Magnet School in Murfreesboro. On behalf of the entire MTSU delegation, I would like to thank our Chinese hosts for their hospitality. This trip has been a wonderful experience for everyone. This was my first time in China and, reflecting upon my experiences there, I am certain it will not be my last. Every day in China was a new experience. One night, I saw the most amazing and vibrant show I have ever seen – The Romance of the Song Dynasty. The colors and dancing were spectacular to me because everything seemed to flow very seamlessly. In Hangzhou, I visited the Lotus Pond, the site of the recent G-20 summit and I have even eaten a jellyfish, which is something I thought I would never do. While in Beijing, I visited The Great Wall, the Forbidden City and Tiananmen Square. My host families were very nice and I enjoyed every minute with them. I will keep in touch with them. Lastly, I would like to again thank everyone for their amazing hospitality and for their friendship – a friendship that will last forever. Justin, 17, travelled to China with his parents, Eric and Kristal. He is a senior at Page High School in Franklin.